AUGUSTA, Maine — After a meeting with administration officials on Friday, Maine legislative leaders looked unlikely to acquiesce to Gov. Paul LePage’s demand for more funding to hire drug agents or else he would activate the National Guard to deal with the state’s drug crisis. House Speaker Mark Eves, D-North Berwick, said a special session before Dec. 10 — the day that LePage has said he would call out the Guard if funding isn’t on its way — is unlikely. He said legislators are coming up with a “comprehensive approach” that includes increased law enforcement and treatment options. The meeting followed a Thursday series of votes by legislative leaders to send bills aimed at addressing drugs to the full Legislature in January. Those included proposals that would increase drug education in schools and reimburse rates for methadone treatment, as well as increase penalties for drug trafficking. “This is not time for politics and political theater, it’s time to focus on solutions,” Eves said. LePage has long called for more drug agents on Maine’s streets to fight an influx of heroin that has plagued the state lately, with 105 people dying of drug overdoses here in the first half of 2015. Earlier this month, he renewed a pledge to use the Guard if legislators don’t act. “We’re working together to ensure that drug use in this state is curtailed and that we focus on dealers and the supply line that is happening in our state,” he said. 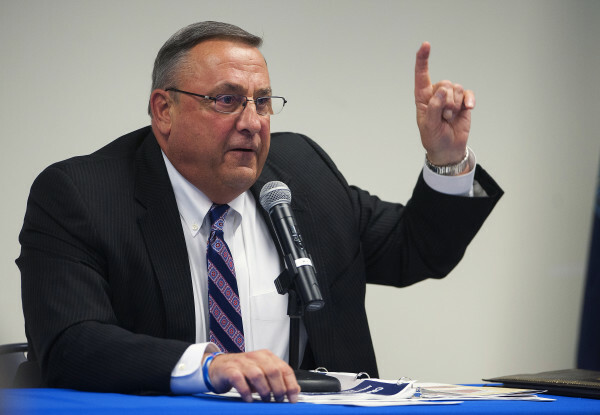 In a letter to leaders provided by the governor’s office after the meeting, LePage asked for a commitment to hiring 10 new agents “out of the gate” when the Legislature returns in January. John Morris, LePage’s public safety commissioner, said that Maine needs to get addicts into treatment, but it also needs 10 more drug agents, noting two drug overdose deaths on Wednesday in Biddeford and the proliferation of meth labs, 49 of which have been busted in Maine this year.